Can I fit a 5″ chimney flue liner? Can I fit a 5″ flue liner? Liner can be purchased in a variety of diameters: 5″, 6″, 7″, 8″, 9″. Rarely will a fitter be fitting anything other than 5″ or 6″. 1. 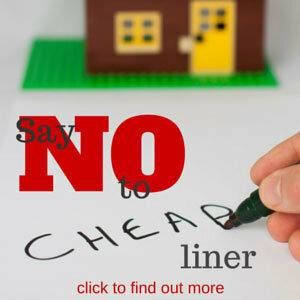 A liner must be 6″ diameter minimum, due to Building Regulations. 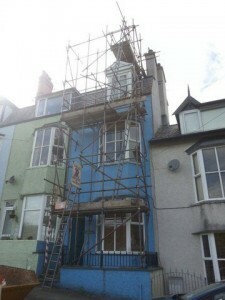 However, a rule allowing 5″ liners was added to Building Regulations in October 2010 – see (3.) below. 2. 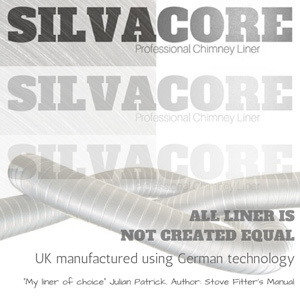 A liner must never be of a lesser diameter than the flue size requirement stated by the manufacturer. So if a stove manufacturer states that the stove requires a flue diameter of 7″, then a 7″ liner must be fitted. A stove having a five inch collar (to fit a 5″ pipe) does not necessarily mean that a 5″ chimney liner can be used. NEVER STEP DOWN IN SIZE ANYWHERE ON THE FLUE ROUTE AS THIS WILL CAUSE A BOTTLENECK AND THE SMOKE MAY BACK UP, EVENTUALLY FILLING FROM THE STOVE (AND IT’S ILLEGAL). E.G. IF A STOVE HAS A 6″ COLLAR IT CANNOT HAVE A LESSER DIAMETER FLUE SIZE. 3. If the stove has a 5″ collar or smaller and the stove manufacturer does not state otherwise** then, if you only wish to burn smokeless fuel, a 5″ liner can be fitted to any stove. If you wish to burn wood you must fit a 6″ liner UNLESS the stove has DEFRA exempt status for wood (many nowadays have) AND the stove manufacturer does not state otherwise. ** The best way to check this is to download the manufacturer’s fitting instructions from the Internet. This is the document delivered with the stove and the document that a Building Control officer will likely peruse. * The correct term is “DEFRA exempt” e.g. “The following appliances are exempt from the Clean Air Act when using the specified fuels…”. I use the term DEFRA-approved sometimes because that is the term that the general public and others in the trade use. Some manufacturer’s use terms like “cleanburn” or “eco-burn” OR “smoke exempt”, As with all such terms check exactly what they mean and do not just “assume” an eco sounding phrase has anything to do with DEFRA. Some manufacturers or installers will still “recommend” 6″ even if all criteria for 5″ are met. A small minority might even state in the fitting instructions that a 6″ liner still must be used. They will often do this because there is more room for error if a person does not have their chimney swept as often as they should – a heavily soot-coated liner obviously loses internal diameter so a larger diameter liner will last longer between sweeps. Having said this, if you burn well seasoned wood at and do not slumber the stove for long periods there will be no soot (my work colleague sweeps his own stove and reports zero soot for the last five years). In my own experience stove manufacturer’s were initially cautious about 5″ liners, I believe because they worry that we will not have them swept regularly enough. As a stove fitter 5″ liners are wonderful, as they rarely ever get stuck whilst inserting them into chimneys. For 6″ liners about 33% are a pig to fit, another 25% will not fit down the chimney without having to open up the chimney and the rest are okay (however, they are much heavier and more unwieldly for fitting purposes than 5″). Five inch liners slip happily down in 90% of cases and are far easier to manhandle. Tip: Unless your chimney is obviously large enough for a 6″ (some chimneys are huge and some you can even see bottom to top) then I suggest you consider the 5″ DEFRA route – especially if the flue is narrow with bends. Update Fri 23 Aug 2013: Today I spoke to a rep who informed me that at least one large stove distributor has had problems fitting their stoves to 6″ liners (when the collar of the stove is 5″). Basically the stoves have underperformed and the company now insist on a 5″ liner. Modern stoves are very efficient so less heat rises up the chimney and it is heat that increases draft. I have never had to break open a chimney to assist a 5″ liner round a bend but have done many times with 6″. BUT CHECK FIRST THAT YOUR STOVE MANUFACTURER ALLOWS IT. Hi, I am putting together a list, for my prospective customers, of DEFRA approved stoves that can be attached to a 5″ flexible liner. This list is for situations where the chimney will not take a 6″ liner (is obvious it will not or we have tried and failed). I tend to favour these stoves for customer recommendations as they provide a backup should the chimney prove difficult for a 6″ liner. I know that building regs allow this on a DEFRA approved stove with a 5″ inch collar but also that manufacturer’s instructions override this if a larger diameter is stated. I have your documentation (Supplementary Operating Instructions for use…) and this states that a chimney must have a diameter of not less than 150mm. Can any of your stoves be added to a 5″ flexible stainless liner? 1. The construction and integrity of the flue system is sound and fit for purpose. 2. The stove is correctly installed and operated in accordance with the manufacturers instruction and burns approved smokeless fuels or well seasoned wood having a maximum moisture content no greater than 20%. With the exception of the UK market it is common practise to install appliances manufactured with 125mm compatible flue collar to chimney systems with a 125mm internal diameter. Furthermore it is likely a stove designed with a 125mm compatible flue collar will operate better when installed with a chimney liner of the same diameter. I trust this information clarifies the situation, should you require any further assistance please do not hesitate to contact me. Kindest regards Name supplied Technical Service Manager XXXX UK Ltd. If my chimney will obviously accept a 6″ liner but I can also legally fit a 5″ liner – which should I choose? Option 1: fit the 5″. This is what I would do. As the man from the above mentioned manufacturer says “it is likely a stove designed with a 125mm compatible flue collar will operate better when installed with a chimney liner of the same diameter”. I would only not be happy if I knew that the stove owner/operator often burned damp wood and/or rarely bothered having the chimney swept. Option 2: fit the 6″. I would be happy with the 6″ and see no issue with doing this. I have however a slight concern that a few modern stoves may not perform “as well” with a 6″ liner. Option 3: Call the manufacturer and ask the question. My only problem with this is that I think it depends on who answers the phone as to what answer you will get. One can use ones own judgement of the confidence of the person on the other end of the phone.